Over the past year I've discovered two podcasts that have captured my creative little heart. Almost every waking moment when I’m not otherwise occupied, I'm either creating or thinking about creating. It's become such a part of who I am, but it can feel isolating at times. I talk everyone's ear off about my ~next big project~ or even some passing idea for a cool sticker sheet. Listening to these podcasts by other creatives who just get it makes me feel more connected to a community, even if it's a one-way street. I love hearing advice from other creatives, especially those who, like me, have day jobs that burn them out, and have to seek creative fulfillment in stolen moments throughout their daily routine. The podcast Magic Lessons is a companion to the book and builds on the material covered within Big Magic by having creative conversations with guests about the creative process and overcoming obstacles, whether real or imagined, to being creative. A wide range of types of creativity are covered, from artists, to writers, to dancers, to comedians. Scanning through the episode titles clues you into the overall nature of Magic Lessons: "Do What Ignites Your Soul," "Show Up Before You're Ready," "Who Gets To Decide Whether You're A Legitimate Artist?" Magic Lessons is the perfect podcast for any type of creative at any level who needs inspiration or permission to create. I only discovered How She Creates because I happen to be a big fan of the illustrator who did artwork for their podcast. She shared the final design on Instagram (@ziedarling) and included a little blurb announcing the podcast. I forgot about the podcast for a few weeks, but was happy to have a few episodes to binge on when I finally subscribed. A few minutes in, I knew like this podcast was for me. Honestly, it sometimes feels like it was created just for me. Caylee and Lauren have a genuine warmth to their voices. Their passion for their podcast, their guests, and their audience just radiates. Each episode is basically like listening in on a conference call / creative playdate between the hosts and a couple creative ladies. 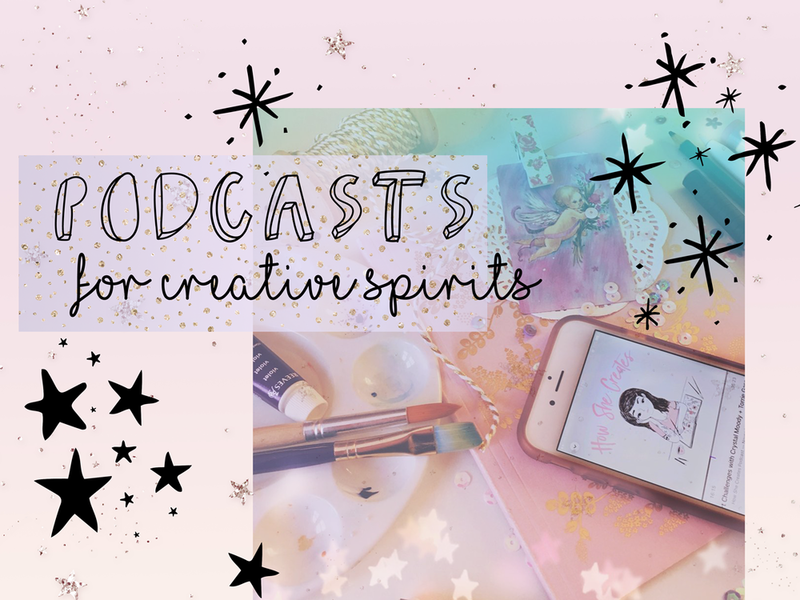 From watercolor to scrapbooking to art journaling, the topics for each podcast are very accessible forms of creativity. It's so enjoyable to learn a little about art forms I haven't tried, and to gain new perspectives about art forms I have tried. No matter the topic, I always take something away from each podcast episode. Plus, I always feel a rush of creative energy after listening, like I just had a coffee date with some artsy babes. One of my favorite parts of How She Creates is following the social media accounts of guests after each episode. In some instances I found that I was already following some of these talented ladies on Instagram. Hearing interviews from people who I am either already connected with on Instagram or have some mutual followers with makes the podcast feel that much more accessible and close to home.